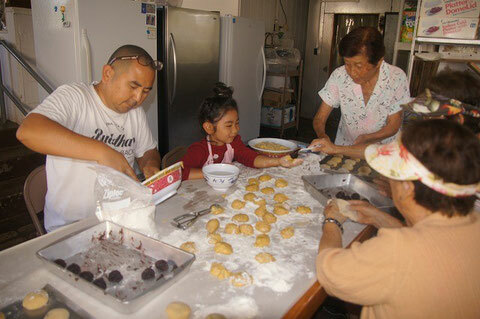 Yesterday, we baked 375 Manju for our sister temple, Kapaa Jodo Mission which is going to have its Bon Dance tomorrow night. I'd like to thank Mrs. Miyahara, Mrs.Yamasaki, Mrs. Kurasaki, Mrs. Akimoto, Mrs.Ebata, Ms. Charlotte, Ms. Kaneko, Mrs. Otsubo, Mrs. Kimura, my wife and children for their time and help. Now I'm thinking about a suggested price. If the price is too high, customers might complain it. On the other hand, if the price is too cheap, temple don't get much profit and it doesn't pay all the volunteer work. 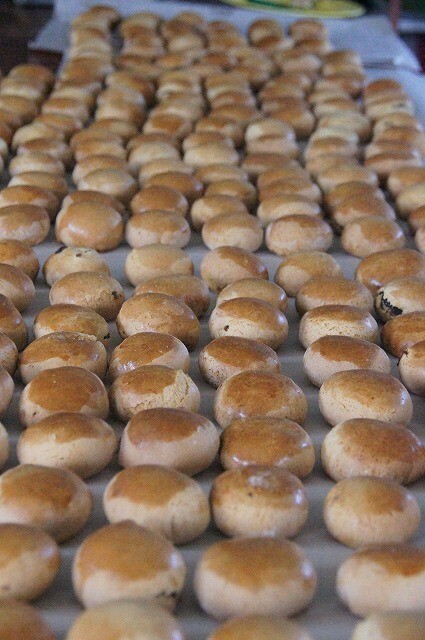 Manju should not be expensive but after taking all the labor into consideration, I should be careful to set a price. So I have calculated the cost of ingredients of Manju. It was my first time to calculate the cost of Manju (rough calculation!) I found out ingreadients of manju cost only 20 cents per manju, but the fact 11 adults worked for 5 hours is very important. 80 cents x 375 manju = $300 (Sales). But this means $228.65 ($300 - $71.35 (ingredients)) would be the profit. That's actually very good.....but We had 11 people who worked. Each person's share of profit would be $20.78. And each one spent 5 hours. $20.78 ÷5 = $4.15 So the possible labor cost would be $4.15 per hour. After thinking about all the work and cost of manju, I realized I should not start Manju business. I just prefer to be a cake baker. I hope to see you at Kapaa Jodo Mission!